“Lunch time!” shouts a chorus of voices as the meal cart rolls into the Verner Center for Early Learning classroom. These preschoolers have worked up an appetite harvesting beans in the garden on the Verner campus, adjacent to Warren Wilson College in Swannanoa. Why all the excitement over a vegetable? Credit Rainbow in My Tummy, the healthy eating program that sprouted from an idea by Verner Center staff. It was cultivated by the center’s board and funders, and today is growing faster than Jack’s beanstalk. The program’s goal is to serve nutritious, fresh, seasonal, and colorful food that reflects community and cultural diversity. “Over the course of a week, a Rainbow kid will eat a rainbow of colors,” explains Director of Development Kelly Brandon. As a proud mom of a Verner alum, Brandon has seen firsthand how the program works. “Research has shown that in the first 2,000 days of life, nutrients make a huge difference in a child’s physical and cognitive development,” she says, adding that children in early care centers typically receive two-thirds of their daily calories from school meals. It’s also worth noting that 65 percent of the children at Verner come from low-income families that may not have the means to provide fresh, healthy meals at home. 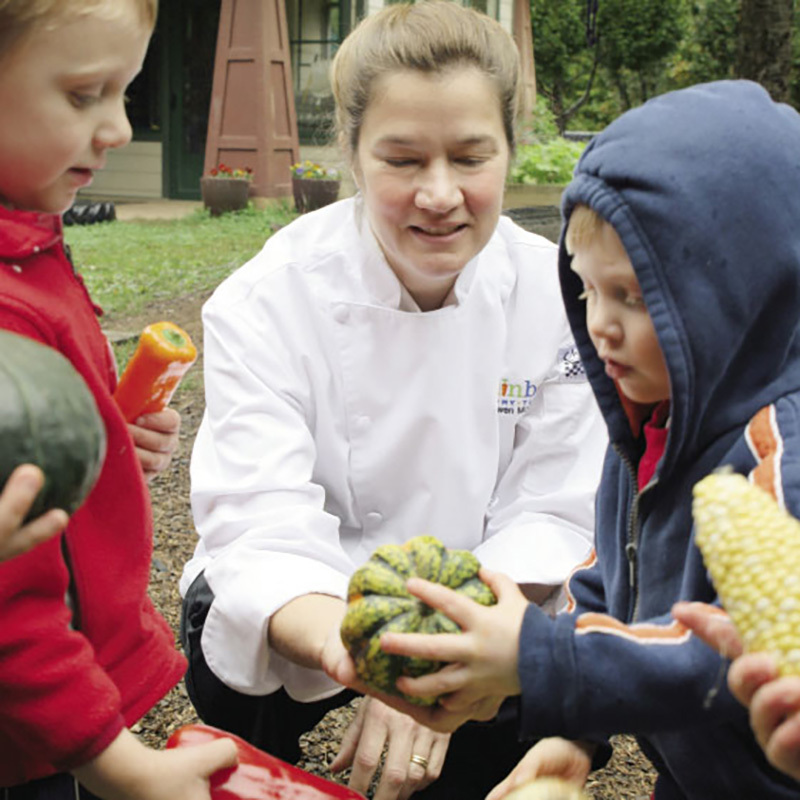 According to Verner Executive Director Jacque Penick, “It all started in 2008 when former kitchen manager Susan Patrice saw an opportunity to improve on the quality of foods served to the children. She took a proposal to the board, and they were all in.” The deep fat fryer was banished from the kitchen, replaced by a vegetable steamer and a tilt skillet. Staff began developing and testing recipes. In: fresh fruits and vegetables, beans, whole grains, hormone- and antibiotic-free meats, eggs, and dairy. Out: canned vegetables, sugary fruit juice, fried foods, trans fat, and processed meats. Beyond menus and recipes, Rainbow in My Tummy is about promoting a positive, healthy food culture both at school and at home. Meals are served family-style to encourage sharing and foster independence. Teachers eat with the children, who choose their own portions and learn to pass serving bowls and use tongs. Today Verner staff are focused on sharing their success with child care centers nationwide. Staff is developing online training to make programs more accessible and less costly, and they make presentations to high-level policy makers at national conferences. To date, 13 other early learning centers in WNC have adopted the program, and centers in 19 states have purchased materials. Home cooks, including many of the parents of Verner children, can get with the program by purchasing the new Rainbow in My Tummy Family Cookbook, a colorful assortment of recipes and sample menus, available through major online booksellers. Perhaps the most ambitious new project is VEG!, short for Verner Education Garden. From the center, a trail leads to the garden, where a welcoming sign reads “Let Nature Be Your Teacher.” In partnership with the Roots Foundation (makers of Roots Hummus), this one-acre lot will be transformed into a permaculture garden and extension of the classroom. Plans include willow archways, rain barrels, and a gazebo. But even now in its early stages, the garden is a favorite spot for staff and children to gather in a “classroom” of logs under an apple tree. “This isn’t just about food,” says Brandon. “The children learn about how ecosystems work, teamwork, motor skills, and stewardship of the land.” In the sharing spirit of the Verner Center, the ultimate goal is to make VEG! a community garden, providing yet another resource for families to serve rainbow-hued food and grow healthier children. Learn more about Rainbow in My Tummy, find recipes, and purchase the cookbook at www.rainbowinmytummy.org.